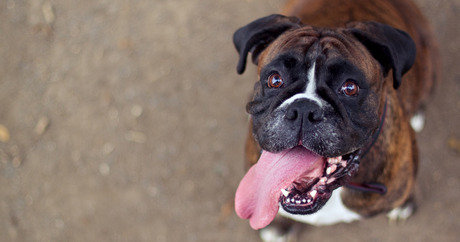 You can treat most common dog illnesses with homemade, natural remedies. In most cases you can use items that you already have around your house, though some of the recipes call for herbs or ingredients that you may need to purchase. In addition to being less expensive than most commercially sold remedies, many pet owners believe that natural is better for the animal and for the environment. 1. Bad breath: Mix shredded carrot, lime juice and half a cup of chopped fresh mint. Your dog may eat this as a treat if you put the solution in ice trays and freeze before giving to him or you can mix it in with his dry food. Try a variation of our Pupsicle minis recipe by adding some lime juice and fresh mint. 2. Car sickness: Grate ginger and add it to homemade peanut butter dog treats. Try adding a little grated ginger to our Peanut butter barks or Paw-tassium poppers recipes. 3. Constipation: Adding a little pureed pumpkin to his food will help prevent and cure constipation. You can either puree fresh pumpkin or use canned pureed pumpkin. Try our Pumpsicle, Pup-kin pie and Howl-o-ween cupcake recipes. 5. Diarrhea: Add a little plain pureed canned pumpkin to his food. 6. Flea repellent: Combine equal parts eucalyptus, fennel, rosemary, rue, wormwood and yellow dock. Sprinkle a small amount of the powder onto your dog’s coat and massage it in thoroughly, making sure to work it all the way down to the skin. You can also add 1 teaspoon per day of Brewer’s Yeast to his food. 7. Gas: Give 1/4 teaspoon plain yogurt to small dogs, 1 teaspoon to dogs 15-20 pounds, and 1 tablespoon to large dogs. Raise their food dish to eliminate air digested while eating. For some fun homemade dog treats with yogurt in them, try these recipes: Yogurt delight, Banana-nilla chillers and Lamb-tastic stew. 8. Insect Bites and Stings: Blend chamomile with vodka. It is better to make it in advance since it becomes stronger as it ages. Keep it refrigerated. The solution will remain sterile for months due to the vodka. Apply it externally as needed, and allow it to air dry on your dog’s skin. 9. Itchy Skin: Give your pet a 10-minute cool bath to relieve itching. For further soothing, you may also add colloidal oatmeal (Aveeno) to the bathwater. 10. Yeast infections: If the area is small enough, sometimes a mixture of water and vinegar may be enough.